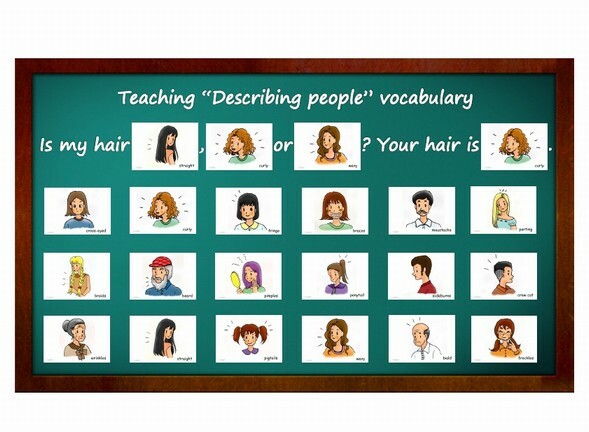 Introduce describing people vocabulary to students and ask students random questions. Do I have a fringe? Do I have a moustache? Do I have blond or dark hair? Do I have freckles? Is my hair straight, curly or wavy? Hand out pictures showing different people. Describe a person and students have to guess the person you are describing. The first person guesses right is the winner and he/his next turn. For more advanced students you can use favourite people, movie stars e.g..
Who I am – Put all student names in a box and each student have to grab a name out of the box without seeing the name. Stick the name onto the students forehead, so he/she cannot see who he/she is. Students must ask questions to find out the name on their foreheads. Answers are only allowed to be “yes” or “no”. The first student who guesses right is the winner.